Sauerbraten (German: sauer, seasoned + Braten, roast meat) is a German pot roast, usually of beef (but other meats such as venison, lamb, mutton, pork, and horse are sometimes used), marinated before cooking in a mixture of vinegar, water, spices and seasonings. Left: Sauerbraten with potato dumplings and red cabbage. 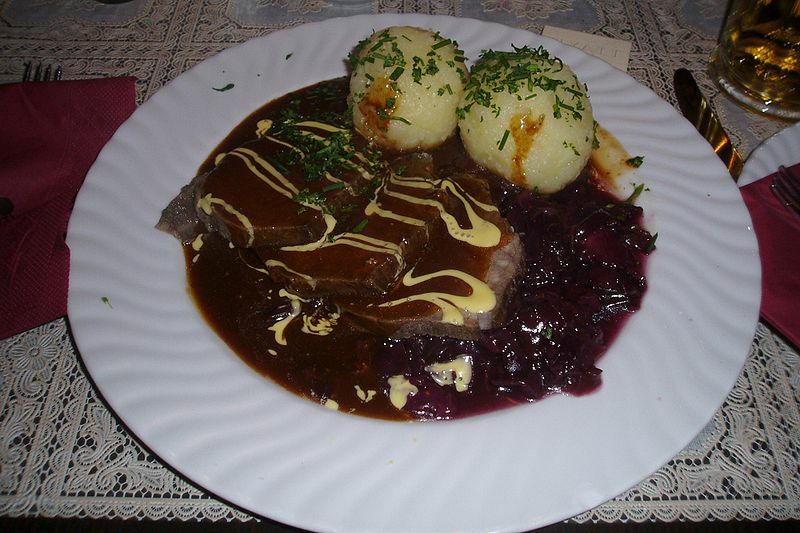 Sauerbraten is traditionally served with red cabbage, potato dumplings (Kartoffelklöße), Spätzle (a type of egg noodles and small dumplings), boiled potatoes, or noodles. Sauerbraten is one of the best known German dishes and several regions boast local versions including: Bavaria, Rhineland, Saarland, Silesia, and Swabia. 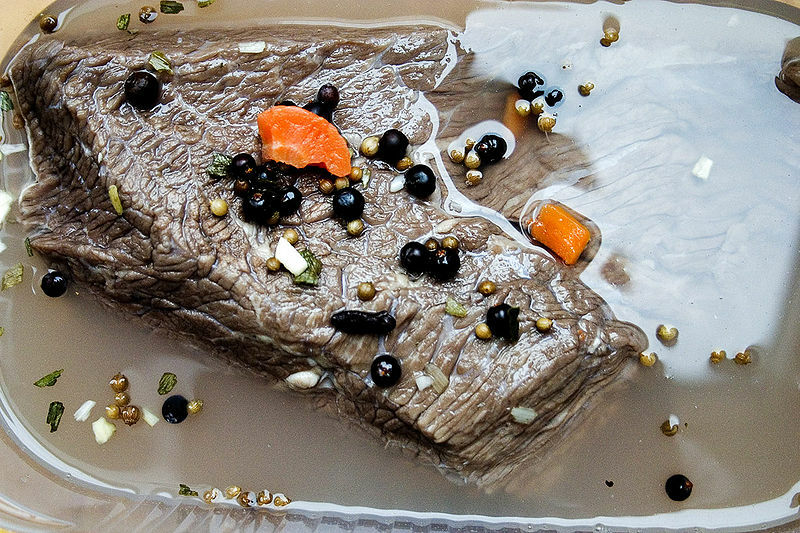 Regional variations of sauerbraten differ in the ingredients of their marinade, gravy, and traditional accompaniments. A solid cut from the bottom round or rump is marinated for three or four days, or as many as 10, before cooking. Red wine vinegar, wine, and/or water typically forms the basis of the marinade, which also includes earthy aromatic spices such as peppercorns, juniper berries, cloves, nutmeg, and bay leaves and less commonly coriander, mustard seed, laurel leaves, cinnamon, mace, ginger, and thyme. The marinade may also include vegetables such as onions, celery, and carrots. The acidic marinade helps tenderize the meat (which is typically a tougher cut) before it cooks. Buttermilk is also used as a marinade in certain regional varieties. After the roast is cooked, the marinade is strained and returned to a saucepan where it is thickened (often with crushed gingerbread, lebkuchen, or gingersnaps, flour, sour cream, brown sugar, and/or roux) which brings both body and flavor to the sauce. 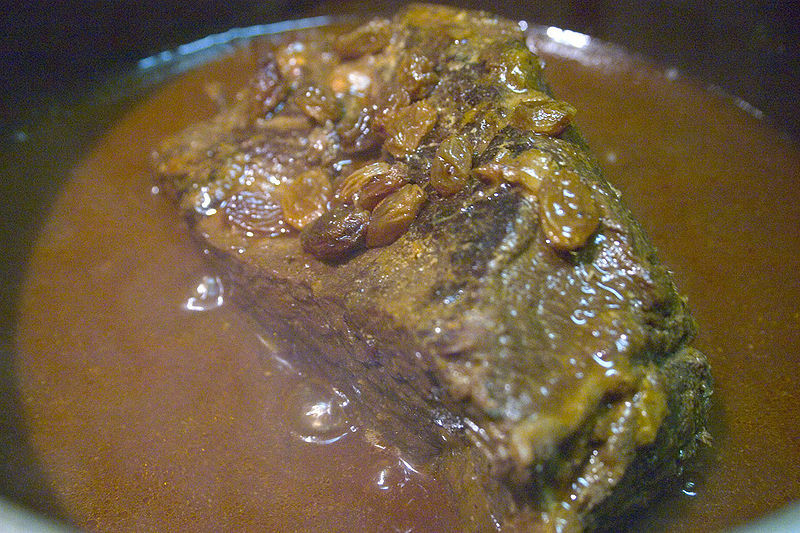 In the popular Rhineland version (Rheinischer Sauerbraten), sugar and raisins are added to the gravy in order to give the dish some countering sweetness. Left: Sauerbraten from the Rhineland - ready with raisins. Venison or other game are often prepared as sauerbraten as the spices and vinegar take away the “wild” taste of the meat.